Mount Shasta is a city in Siskiyou County, California, at about 3600ft above sea level on the flanks of Mount Shasta, a prominent northern California landmark. Kick off your visit on the 8th (Sat): get impressive views of Shasta-Trinity National Forest and then take your sightseeing to a higher altitude at Mount Shasta. Get ready for a full day of sightseeing on the next day: explore the activities along Lake Siskiyou, get curious at Mt. Shasta Sisson Museum, and then look for all kinds of wild species at Mount Shasta Fish Hatchery. To see reviews, maps, traveler tips, and other tourist information, use the Mount Shasta online road trip planner . Fresno to Mount Shasta is an approximately 6-hour car ride. You can also fly. Traveling from Fresno in June, things will get slightly colder in Mount Shasta: highs are around 82°F and lows about 50°F. Wrap up your sightseeing on the 10th (Mon) to allow time to travel to Glacier National Park. Kick off your visit on the 10th (Mon): appreciate the extensive heritage of Garden Wall. 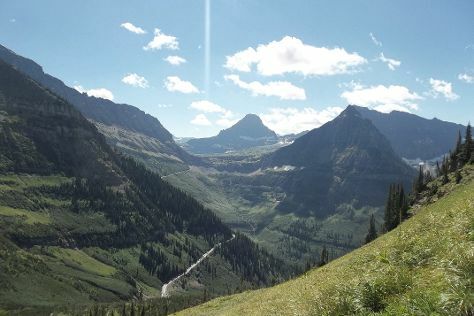 Get ready for a full day of sightseeing on the 11th (Tue): admire the verdant scenery at Logan Pass, then explore and take pictures at Going-to-the-Sun Road, and then admire the sheer force of Virginia Falls. For other places to visit, traveler tips, maps, and other tourist information, use the Glacier National Park travel route planning app . The Route module can help you plan travel from Mount Shasta to Glacier National Park. The time zone difference moving from Pacific Standard Time to Mountain Standard Time is 1 hour. Plan for a bit cooler temperatures traveling from Mount Shasta in June, with highs in Glacier National Park at 75°F and lows at 45°F. Finish your sightseeing early on the 12th (Wed) to allow enough time to drive to West Yellowstone. 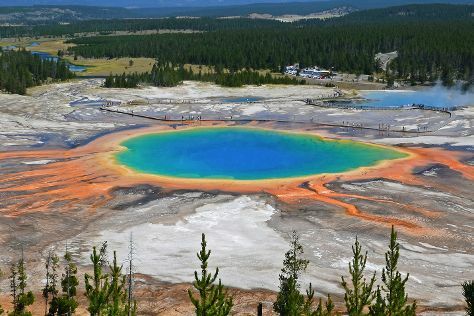 Step out of the city life by going to Fairy Falls and Grand Prismatic Spring. Explore the numerous day-trip ideas around West Yellowstone: Yellowstone National Park (Gibbon Falls, Old Faithful, & more). To see reviews, ratings, traveler tips, and more tourist information, go to the West Yellowstone trip planner . Getting from Glacier National Park to West Yellowstone by car takes about 7.5 hours. Other options: do a combination of taxi, flight, and shuttle. In June, West Yellowstone is slightly colder than Glacier National Park - with highs of 69°F and lows of 35°F. Finish your sightseeing early on the 15th (Sat) so you can drive to Jackson Hole. Start off your visit on the 16th (Sun): tee off at Teton Pines Country Club, then admire the masterpieces at National Museum of Wildlife Art, and then don't miss a visit to Town Square. To find traveler tips, where to stay, other places to visit, and other tourist information, use the Jackson Hole trip planning tool . Getting from West Yellowstone to Jackson Hole by car takes about 3 hours. Other options: do a combination of car and bus; or do a combination of shuttle and bus. In June, plan for daily highs up to 72°F, and evening lows to 39°F. Wrap up your sightseeing on the 16th (Sun) early enough to travel to Salt Lake City. Start off your visit on the 17th (Mon): get a new perspective on nature at Natural History Museum of Utah, then contemplate in the serene atmosphere at Temple Square, then take in the spiritual surroundings of Salt Lake Temple, and finally contemplate in the serene atmosphere at The Tabernacle. For ratings, reviews, photos, and tourist information, refer to the Salt Lake City trip planner . You can fly from Jackson Hole to Salt Lake City in 2 hours. Other options are to drive; or take a shuttle. Traveling from Jackson Hole in June, expect nights in Salt Lake City to be much warmer, around 62°F, while days are a bit warmer, around 89°F. Cap off your sightseeing on the 17th (Mon) early enough to travel back home.